Find the right tour for you through Dingle. We've got 85 tours going to Dingle, starting from just 3 days in length, and the longest tour is 38 days. The most popular month to go is September, which has the most number of tour departures. 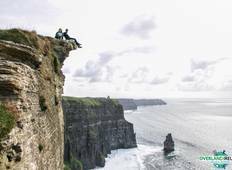 "My husband and I had the best vacation with Overland Ireland! We had a blast seeing..."
"Initial " snafu " was forgotten as the tour guides were both knowledgeable and entertaining...."
"Fantastic trip!! Such an amazing way to see Ireland! The small group made it so much..."